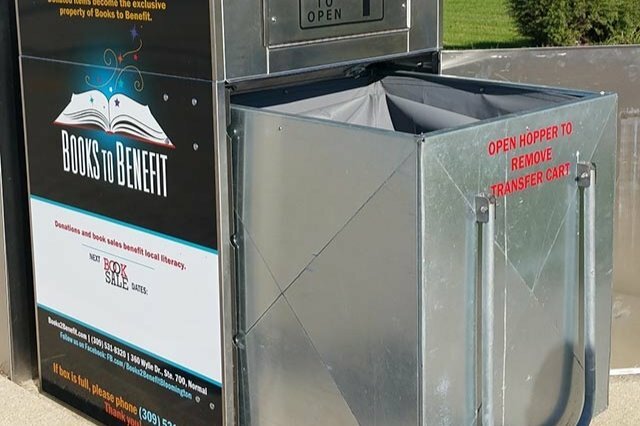 Thanks to the generosity of our donors, Books to Benefit was able to upgrade our current drop box with a refurbished one to protect our donated books! We are hoping to raise enough money to purchase a second box for one of our other locations and need your help! We are Books to Benefit , an all-volunteer organization passionately working to support literacy. We collect gently used books from our community drop boxes, after which our volunteers sort the books by genre for eventual sale at one of our two semiannual book sales. The only income we receive is from book sales and individual donations. We are in desperate need of a new box, which is very expensive. A new box costs over $5000. We have been shopping around and found a refurbished box for $2600, half the cost of a new one. But, we need your help before the refurbished box is gone! · and assure that works of scholarly importance and/or unusual publication history or content find appropriate homes offering ready access to these works. Choose your donation level to help us write our story! Know that your contribution helps our story begin. Make a statement to support literacy in our community. Show your support for our mission. Tell us why literacy is important to you. Commit to literacy for someone you love. Ensure there are books to read in the community. Give others the gift of literacy. Make literacy an ongoing priority. Help us get the word out; share our link to your Facebook Timeline!